If your dog or cat suffers from phantom limb pain after amputation surgery, consider trying Farabloc, a holistic pain-relief alternative to prescription drugs like gabapentin. Farabloc is a non-pharmaceutical phantom limb pain therapy that alleviates pain in animals and humans by shielding the body from man-made and environmental electromagnetic fields (EMF). According to published research from the U.S. National Library of Medicine (PubMed), the absence of high EMF can reduce acute and chronic pain musculoskeletal pain in the body, which also reduces existing chronic conditions like residual or phantom limb pain. When canine or human amputee patients use the patented Farabloc fabric to cover the affected area, pain relief is achieved when the high EMFs are blocked. 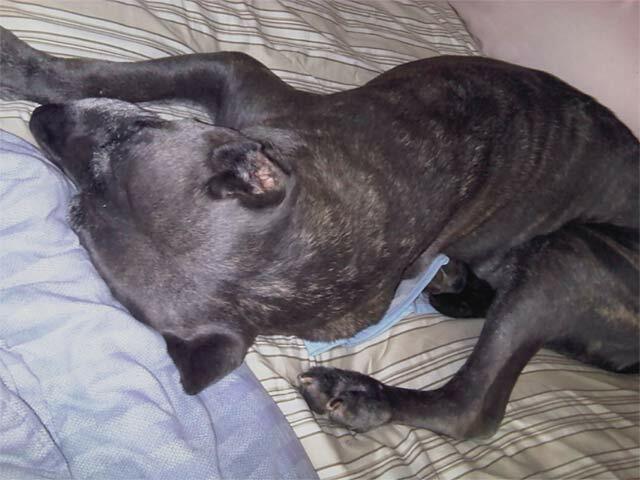 New tripawd “Puppy” finds comfort resting on Farabloc fabric. Phantom limb pain is a complex post-amputation condition affecting both humans and animals. Characterized in animals by random shrieks and yelps that seem to appear randomly and without provocation, phantom limb pain is a cross-species side-effect of amputation surgery that researchers believe is the result of complex nervous system reactions to severing blood vessels, nerves, and muscles during the procedure. Human patients describe the pain as a cramping, stabbing or crushing sensation in the area of the amputated limb. Dogs’ reactions to phantom pain are expressed as sudden yelps or screams. Occurring randomly or continuously, many Tripawd dogs are affected several weeks after the initial procedure. We have not had reports of cats experiencing phantom limb pain but that doesn’t mean they don’t, we just haven’t heard about it yet. Although some veterinarians claim that phantom limb pain doesn’t exist in animals, human amputees have been discussing it for years, which leads one to believe that amputee animals also feel phantom pain. Here at Tripawds we can say with confidence that phantom pain does occur in animals; we frequently receive reports from members who believe their dogs are affected by it. Unfortunately there is little dedicated research for phantom limb pain in humans and even less published research when it comes to phantom pain in animals. Still, most forward-thinking physicians and veterinarians agree that this condition is painfully real and should be treated for a faster, pain-free amputation recovery. If a canine amputee is suffering from phantom pain, a veterinarian will typically prescribe Gabapentin, an anticonvulsant shown to reduce neuropathic pain in humans. A variety of veterinary studies about Gabapentin for post-op pain exist but there is wide dispute within the medical community about its actual effectiveness in animals after amputation surgery. Regardless, with Gabapentin side effects in dogs such as sleepiness and stumbling, may pet parents are looking for another option to help alleviate their dog’s symptoms. We believe Farabloc can be a good alternative to treating phantom pain in most dogs and cats without a prescription. Farabloc is a lightweight, linen-like fabric infused with a special pattern weave of ultra-thin stainless steel and nylon thread designed to shield the body from high frequency electromagnetic fields, the absence of which studies indicate reduce pain and improve recovery. Similar to the Faraday cage shielding technology, Farabloc fabric can alleviate pain by reducing the high EMF’s ordinarily absorbed by tissue. Many users have found that folding the fabric into layers and then placing it on the affected area makes it even more effective. Developed over 30 years ago in Canada, Farabloc has been quietly but successfully alleviating arthritis, chronic muscle aches and phantom pain in humans, horses and dogs. 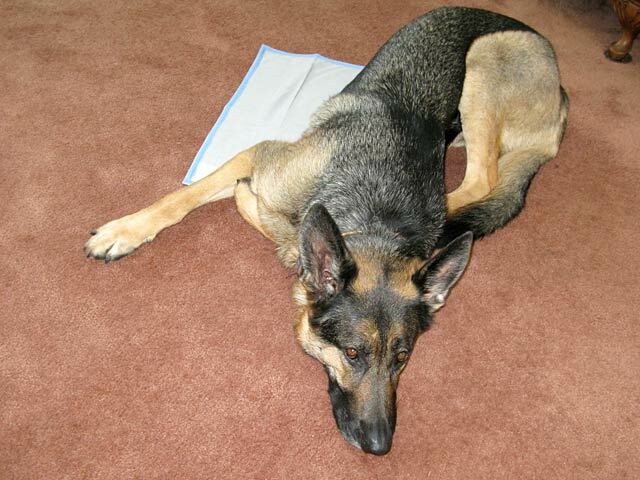 Today we hope that Tripawds can also find relief from this unique pain relief product. 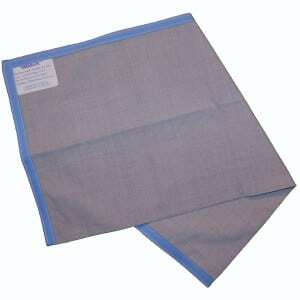 See All Farabloc EMF-blocking Pain Relief Blankets. Although we were naturally skeptical at first, one of the reasons we believe in the science behind Farabloc is that the success of its technology has been scientifically documented in the U.S. National Institute of Health online database PubMed as well as dozens of reputable health journals such as Canadian Journal of Rehabilitation, the Clinical Journal of Sports Medicine and the Clinical Journal of Pain. Like the dog in the testimonial, Tripawds spokesdog Wyatt Ray also naturally gravitated toward a Farabloc sheet we recently ordered from the company. Although Wyatt doesn’t suffer from phantom limb pain, he does have the usual aches and pains that accompany any amputee dog who tends to overdo it sometimes. To our amazement, less than five minutes after we put the Farabloc sheet on the floor, he immediately sat down on it and laid there for over an hour. 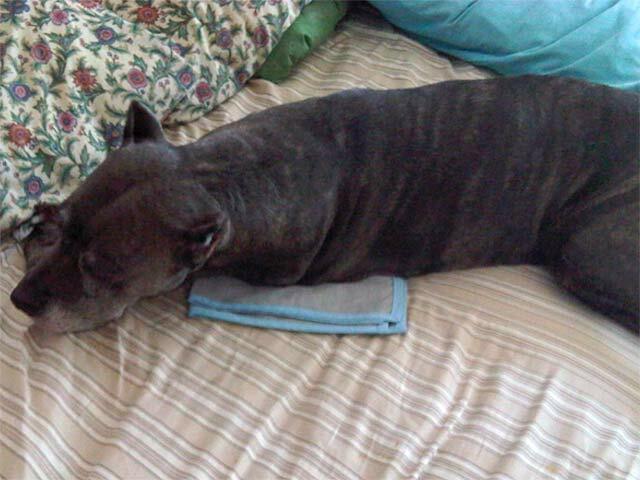 He chose to lay on the thin fabric swatch over his comfy foam bed just a few feet away. Since then Wyatt has gravitated to Farabloc on and off throughout the last few days. Although he can’t tell us verbally that he is receiving some kind of pain relief benefit from it, the fact that since we received it he often chooses to lay on the Farabloc instead of his own bed tell us that there is something to this pain-relief product. As he grows older (he is four now), we believe he will find the product to be more beneficial. When you purchase from Tripawds, your cost includes free shipping via Canada Post delivery. Texas residents pay applicable sales tax. PLEASE NOTE: The opinions expressed herein are the personal experiences of Farabloc users. As with any holistic product, this solution may have varied affects on different dogs. Please visit the links above for research and more information about Farabloc. Consider your purchase carefully, there are no returns for this product. All orders ship via commercial ground couriers. Due to the nature of holistic products that can have varying results with different patients, we cannot guarantee the effectiveness of Farabloc with any animal (or human). Holistic therapies that work on some patients may not work on others. We are confident you will find Farabloc works, but please consider your purchase carefully as we cannot allow returns for this product. Thank you for your understanding. A portion of Farabloc proceeds helps keep the free Tripawds community onine. What size is Wyatt using? I think Hannah could get by with the 20 x 20 but it seems that the 20 x 40 would allow for the more effective “folding over”. She doesn’t yelp or cry…just tries to “move away from it. Sometimes it doesn’t happen for days and sometimes a couple of times. Lasts probably less than a minute. Anyway, I think this would help her. What “sold” me of everything I read was how Wyatt and others seems to gravitate towards it. Regardless, I can try it for my aches and pains if she doesn’t like it. Thanks again sooooooo much for all you do for all of us every single second of everyday. Paw shucks you are so sweet, thank you for your kindness. We were excited to hear about Farabloc because it’s a drug-free option, then when we saw how much reputable research was behind it, then saw how Wyatt reacted, we were impressed. I can’t promise it will work on all dogs but based on what we’ve seen it’s worth a shot. It sounds like Hannah’s nerves are still trying to understand that the limb is gone. I’m glad the reaction isn’t more serious than what she’s experiencing. Wyatt is currently using the 20×20 size. While it can be folded over, I think that if you want to do that, for a dog Hannah’s size you might want to consider the next size up. Farabloc’s wonderful company representative, Dr. Nixdorff, might also be able to give you some feedback (his email address is above). Thanks for your interest Sally, and as always, your infectious enthusiasm and kindness! Give Hannah a big smooch from us. Is this fabric for after their surgery or can he continue to use it? Great question Salina, thanks for asking. 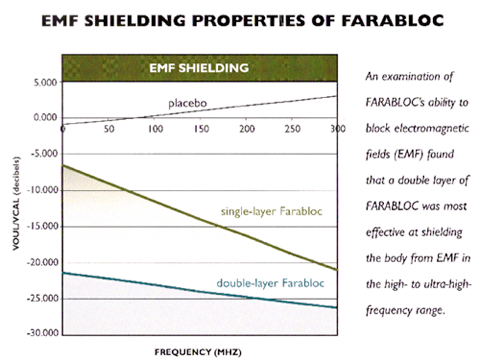 The EMF blocking technology behind Farabloc has been proven to help alleviate various types of pain. It is especially helpful for reducing the effect of phantom limb pain, that is what it was originally designed for. But it will continue to work whenever it is used. So yes, it can continue to be used. Hope this helps! If you have more technical questions, please feel free to follow the links in the post to speak directly with the manufacturer. Where i can order this product from I live in the UK regards Kay PS she is a little female papillon. Hi Kay, thank you for your interest. This product does ship to the UK, all you have to do is place your Farabloc order here. Thanks! Thanks for the comment Nichole! We have a growing number of tri-kitty bloggers. Please consider sharing your story with a free blog too. Or, post in the forums where you will receive much more feedback from members. What a truly fantastic invention, my dog recently had his front paw amputated. Do you ship this product to the UK? Yes Dave, Farabloc will ship to the UK. Just be sure to add the International Shipping fee above to your cart before checking out.